Adam Colclough lives and works in the West Midlands, he writes regularly for a number of websites, one day he will get round to writing a book for someone else to review. Back in the CIA fold Court Gentry, aka ‘The Grey Man' is sent to Hong Kong to find a defector from the Chinese secret service with access to the country’s cyber secrets. The trouble is everyone else is looking for him too. Caught in the crossfire between superpowers Gentry must find his objective, get him out alive and play the competing agencies off one against another. A tall order, even for a man with his unique skill-set. 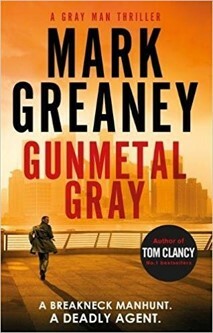 Long-time Tom Clancy collaborator Mark Greaney is an old hand at writing page turning thrillers. Here he kicks the action off around three pages in, and keeps it going at a break neck pace to the final paragraph. His narrative spans the globe and the fight scenes are a skilfully choreographed ballet of bullets, knives and fists. Greaney also writes well about the interplay of the various security agencies involved, with the ambitions and vendettas of their commanders sometimes taking precedence over the national interests they supposedly serve. This isn’t, perhaps, the sort of book for people who seek great emotional depth in their fiction. Court Gentry [aka The Grey Man] is often a closed-book, understandably so since he lives in a world where friends and enemies are interchangeable. If what you are looking for is relentless action, exotic locations and a central character with a clear, if highly individual, moral code; then this and the other books in the series are a rewarding read.